Are Frozen Foods Healthy for Your Diet? When it comes to preparing and serving a quick meal, nothing beats the convenience of frozen foods. They fit nicely in your freezer, keep for a long time, and they're so easy to prepare. Stocking up on frozen foods can also be a great way to save money if you buy them when they're on sale. And of course, you can also freeze fresh perishable foods to keep them longer, which is a great way to cut down on waste. The act of freezing doesn't make food healthy or unhealthy; it really depends upon the nutritional content of the food that gets frozen. Frozen fruits and veggies can be very healthy, but frozen pizzas, snacks, and other entrees can be quite unhealthy. If your food is nutritious before it's frozen, it will still be good for you after. Does Freezing Change the Nutritional Value of Food? Freezing doesn't affect the calorie count, the fiber content, or the amounts of minerals. It can make a difference with a few vitamins, such as folate and vitamin C. But, most of the nutritional value will be maintained after freezing. Freezing doesn't change the amount of fat, protein, carbohydrates or sugar either. The fluid content can change, which is apparent when you thaw your food. You might see a puddle of liquid as the water drains away. Do Frozen Foods Weigh the Same as Fresh When Counting Calories? A closed container of food should weigh the same before freezing and after freezing. But, if there is a lot of liquid that drains from the food as it thaws, the food you serve may weigh a little less. If the only fluid lost is water, the calorie count won't change for that serving, but it could change the apparent size of the portion. When you buy frozen foods, look for products that don't have a lot of added sugar, sodium or high-calorie sauces. Sometimes it's easy, but it can be a little tricky when you get beyond a simple bag of veggies. Here are a few tips for selecting healthy frozen foods. Choose plain vegetables (many can be steamed in the microwave in the bag), rather than products that also contain sauces. If you really love the simplicity of veggies and sauce, look for sauces that are made with less fat and sodium. You'll need to look at the Nutrition Facts labels and remember to take serving sizes into consideration. Same idea with fruits. Choose fruits that are frozen without added sugar or syrup. And watch out for extra calories in frozen fruit smoothie mixes because they're often made with added sugars that you don't need. Choosing healthy frozen meals and snacks will take a bit of detective work. They're often high in saturated fats, sodium, sugar, and calories, but not all that high in vitamins and minerals. Pizzas, snack rolls, breakfast sandwiches, burritos, fried chicken dinners, and other meals are not usually good choices. But, if you compare labels or search in the natural foods section of your store, you can find frozen meals and snacks that are better for you. Frozen meats, fish, seafood, and poultry are best if they're made without any extra ingredients as well. Cut back on breaded chicken, fish sticks, corn dogs and other battered and breaded foods. Opt for plain frozen chicken breasts, plain shrimp, and fish fillets that aren't breaded. While almost anything you buy, grow or cook can be frozen, eggs that are still in their shell and anything in sold in a can or sealed container is not meant to be frozen. And some foods like mayonnaise, salad dressing, and cream sauces don't fare well in the freezer. Fruits can be peeled and cut into 1 to 2-inch chunks and placed on a baking sheet and freeze until they are solid. Place the fruit in smaller freezer bags. This is a good way to keep fruit for smoothies or recipes that call for fruit. They may not look pretty, but they'll be just fine for cooking or blending. Vegetables take a little more work for optimal storage. They should be blanched before putting them into freezer bags. To blanch your veggies, put them in boiling water for a minute or two and then plunge them into ice water to stop the cooking process. You don't want the veggies to be cooked all the way through, but the blanching helps retain their freshness better. Raw meats, poultry, and fish can be wrapped in freezer proof paper and placed right into the freezer. Leftovers or meals that you prepare ahead of time can be frozen in containers made for freezing. 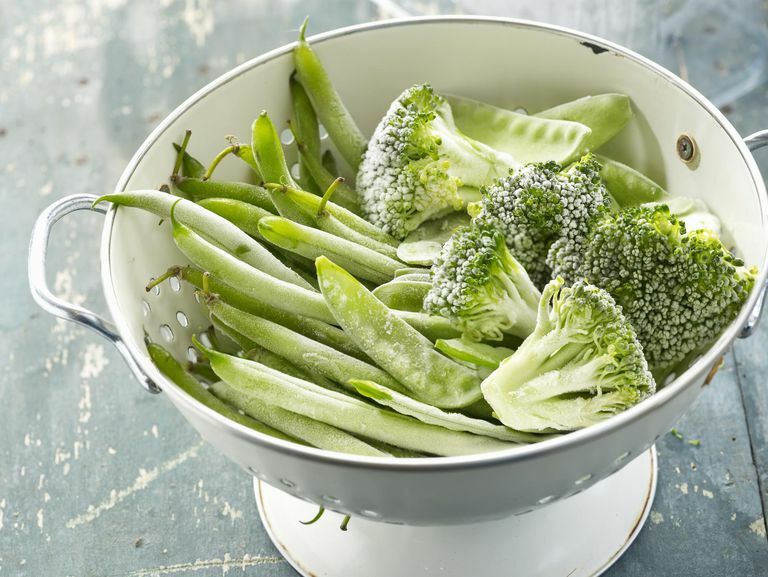 Frozen vegetables don't usually need to be thawed before cooking. You can boil, steam or put them in the microwave right away. Fruits and berries should be thawed slightly before you use them, but if you let them thaw completely, they might get too mushy. Frozen meats usually need to be thawed before cooking. Otherwise, you run the risk of overcooking the outer parts of the meat and undercooking the center. Thaw your foods by placing them in the refrigerator or cold water. Don't let them thaw at room temperature because bacteria can grow on the meat if it's left out for more than an hour or two. It can take a long time to thaw your foods, especially larger cuts of meat, so plan ahead. If you must cook your meats before they are thawed, be sure to increase the cooking time by about 50 percent and use a meat thermometer to check for doneness. Academy of Nutrition and Dietetics. "Frozen Foods: Convenient and Nutritious." Academy of Nutrition and Dietetics. "Thawing Frozen Foods." United States Department of Agriculture Food Safety and Inspection Service. "Freezing and Food Safety."